Vincent van Gogh’s career as an artist was brief, intense, only successful long after his death, but of enormous influence. Of the post-Impressionists, he remains the most popular today, his paintings drawing crowds wherever they go on display. Van Gogh painted in several genres, and is now perhaps best-known for his floral still lifes. However, he started and ended his career as a landscape artist, and painted a large number of highly innovative representations of trees. Indeed, some types of tree such as the cypress are very strongly associated with him. Vincent van Gogh (1853–1890) was born and raised the oldest surviving son of a minister in the Dutch Reformed Church, in a village in the southern Netherlands. He was trained as an art dealer with Goupil, and sent to their London branch in 1873. Although successful there, when moved to Paris, he became increasingly resentful of art being traded as a commodity, and was sacked. He returned to England, working as an unpaid voluntary teacher, then assisting a Methodist minister. His religious zeal growing, he started studying theology in Amsterdam, but failed two exams. In 1879 he started work as a missionary in the Borinage coal-mining district of Belgium, where he began to draw and paint. He entered into study at the Académie Royale des Beaux-Arts in Brussels, but soon discontinued. With a turbulent home and personal life, he moved to the Hague in 1882, where Anton Mauve helped him to paint in oils and watercolour. He lived with an alcoholic prostitute for some time before moving to Nuenen in 1883, where he completed his first major oil painting. in 1885 he moved to Antwerp, where the following year he matriculated in painting and drawing from the Academy of Fine Arts. He then moved to Paris, where he studied in Cormon’s studio, and later shared accommodation with his brother Theo, who was an art dealer with stock of Impressionist works. He met and befriended Paul Gauguin in 1887, then moved to Arles in early 1888, aspiring to create an art colony there with Gauguin. There he rented ‘the Yellow House’ and painted extensively. He invited Gauguin to visit him, in the hope of creating the colony, but the two clashed, van Gogh self-mutilated by slicing off part of his ear, and he ended up being committed to an asylum. In May 1889 he entered hospital at Saint Paul de Maussole, Saint-Rémy, where he continued to paint. In May 1890 he moved to Auvers-sur-Oise, where he could be watched over by Dr Paul Gachet, a good physician, amateur painter, collector, and friend to many artists. He continued to paint avidly, but his mental state did not stabilise. He shot himself in the chest on 27 July 1890, but surprisingly survived until 29 July. There remains controversy over the means of his death. Vincent van Gogh (1853–1890), Tree roots in a Sandy Ground (‘Les racines’) (1882), drawing, 51.5 × 70.7 cm, Kröller-Müller Museum, Otterlo. Wikimedia Commons. Van Gogh’s early drawings show a fascination for the weird and often grotesque forms seen in some old trees, including pollards and these twisted roots. At this stage he seems to be exploring their form, which is heightened by their bleak and barren situation. 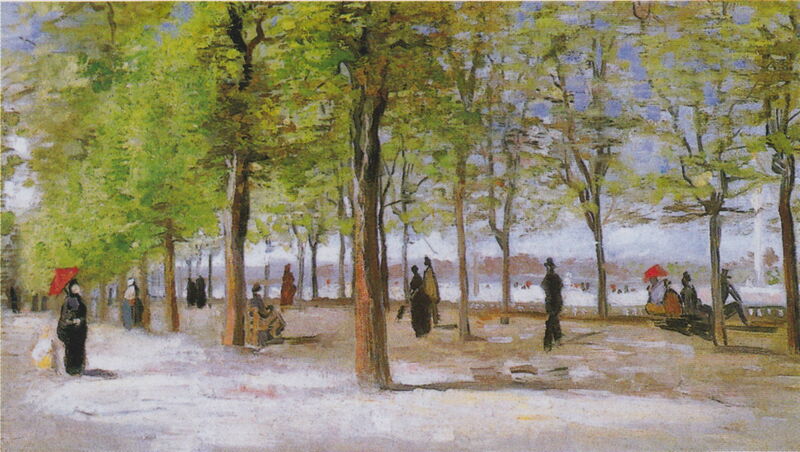 Apparently influenced by Corot, Pissarro, and others, this sophisticated depiction of an avenue of poplars is an early step towards his mature style. 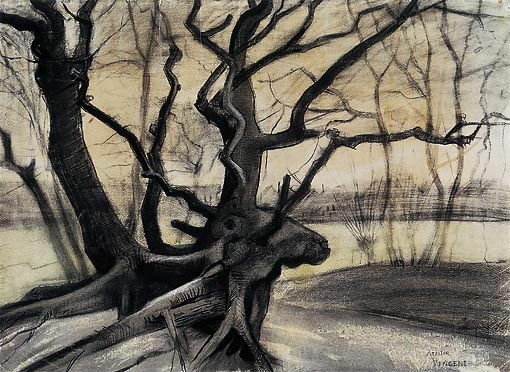 He avoids a conventional composition in which the motif is viewed along the line of the lane and trees, instead showing the semi-regular array of trees spread across a slightly wide-angle view, as if in grillage. The trunks are painted gesturally, particularly that of the pollard in the foreground. Foliage, which is placed according to the indicated anatomical structure, is shown in detail, using a range of marks which may have been derived from Corot’s late style (from 1850). Already some of the broad brushstrokes making up the bed of the lane are starting to become organised. This more sketchy watercolour shows van Gogh’s structural approach more clearly. Even though it was painted quite quickly, as shown by many of the marks of branches, he has kept foliage to the branch structure, and avoided making the canopies look solid. 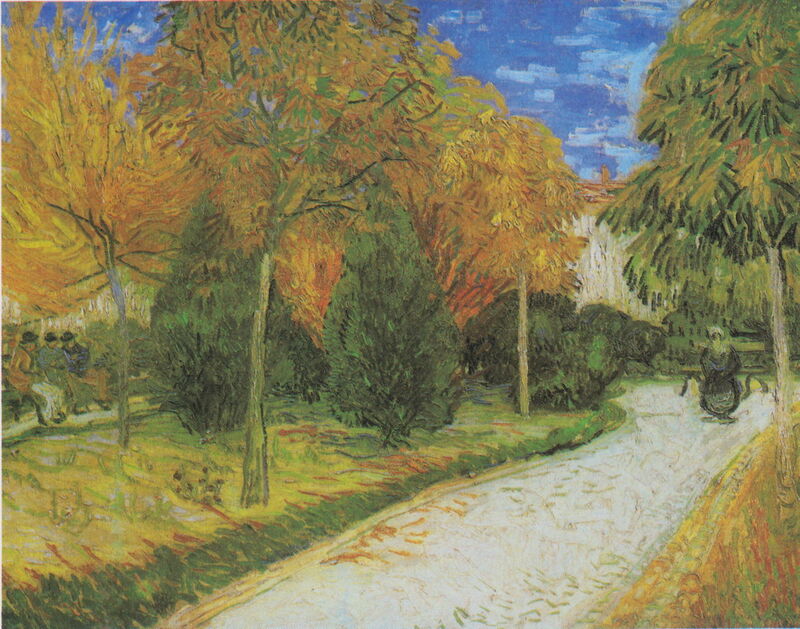 Vincent van Gogh (1853–1890), Lane in the Jardin du Luxembourg (1886), oil on canvas, 27.1 × 46.1 cm, Clark Art Institute, Williamstown, MA. Wikimedia Commons. He maintained his light touch in this bright and colourful sketch of the famous gardens in Paris, the following year. 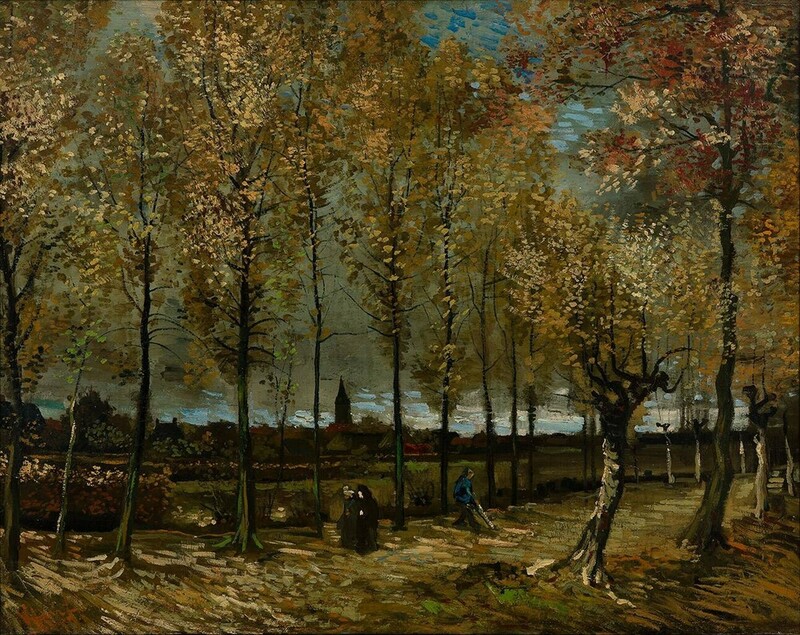 He used a similar, but reversed, composition to that of Poplars near Nuenen (1885), breaking foliage up in the closer canopies to avoid solidity. Visible marks are relatively few, and not organised. 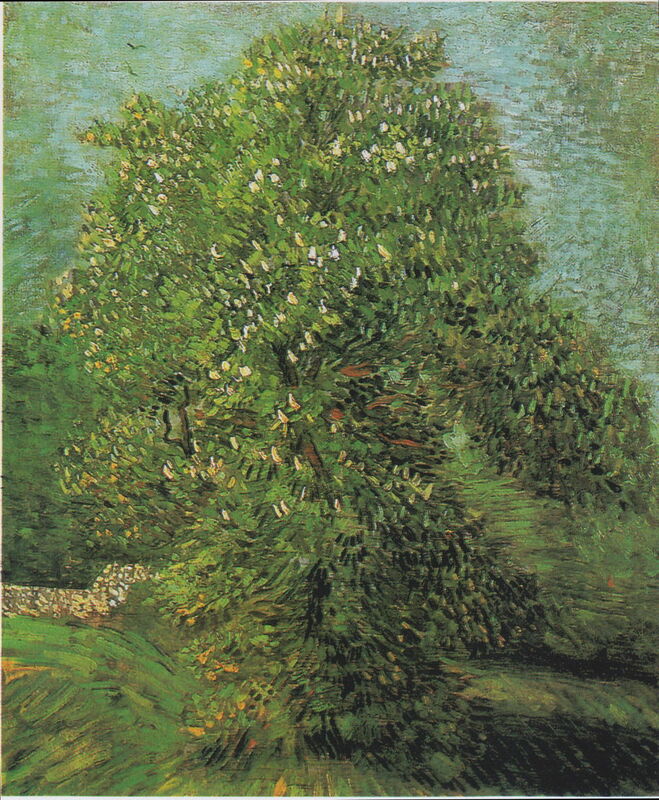 The following year sees clear change in his style, in this depiction of a Blossoming Chestnut Tree (1887). Although there are a couple of glimpses of the underlying trunk and branch structure, this chestnut, in full leaf and flower, has a more solid canopy built from visible and organised brushstrokes. These marks are starting to forms whorls and swirls in places, including the background vegetation. The tree is only demarcated from that background – the grass below, and trees behind – by discontinuity in the structure and orientation of the marks. Vincent van Gogh (1853–1890), Trees and Undergrowth (1887), oil on canvas (digital reconstruction of colours), 46.5 x 55.5 cm, Van Gogh Museum, Amsterdam. Photo by Szilas, via Wikimedia Commons. 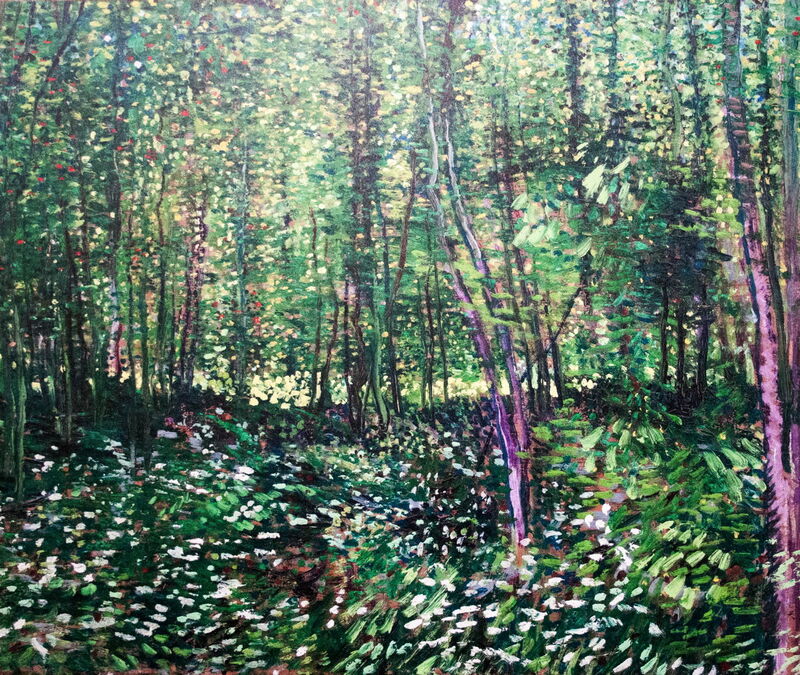 Seen here in a digital reconstruction which attempts to show its original colours, in Trees and Undergrowth (1887), van Gogh’s brushstrokes are less clearly linked to underlying structure, and their orientation is starting to become organised into patterns. Vincent van Gogh (1853–1890), The Pink Orchard (1888), oil on canvas, 64 x 80 cm, Van Gogh Museum, Amsterdam. Wikimedia Commons. 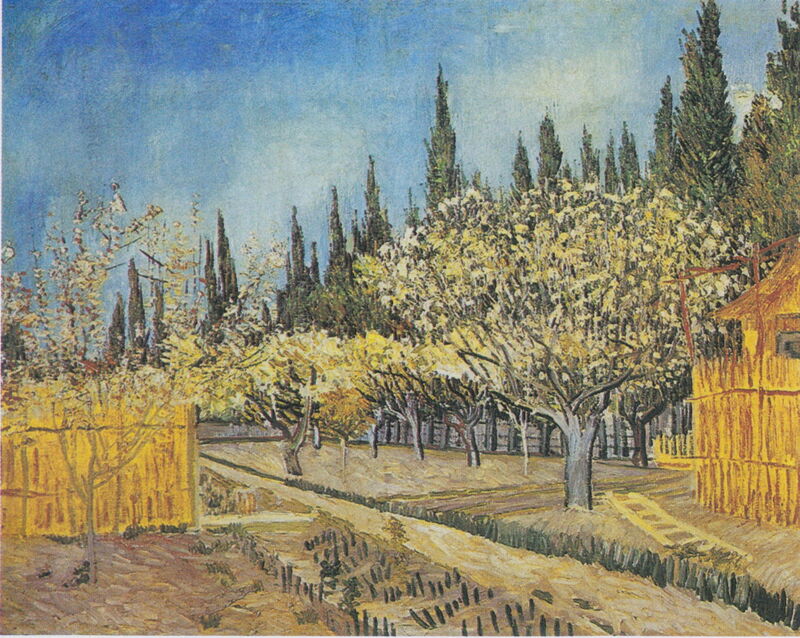 Shortly after arriving in Arles, in 1888, the fruit trees came into flower, and van Gogh painted a triptych intended for his brother Theo’s apartment. This and the painting below formed the left and centre works for that. 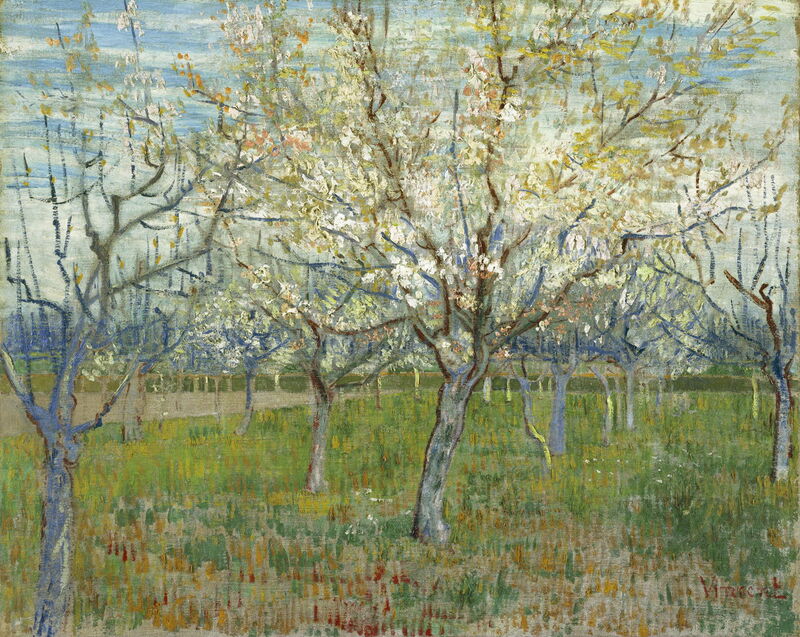 He also painted several other views of fruit trees in bloom – including View of Arles, Flowering Orchards (1889) below – some of which may also have been intended to be grouped together. 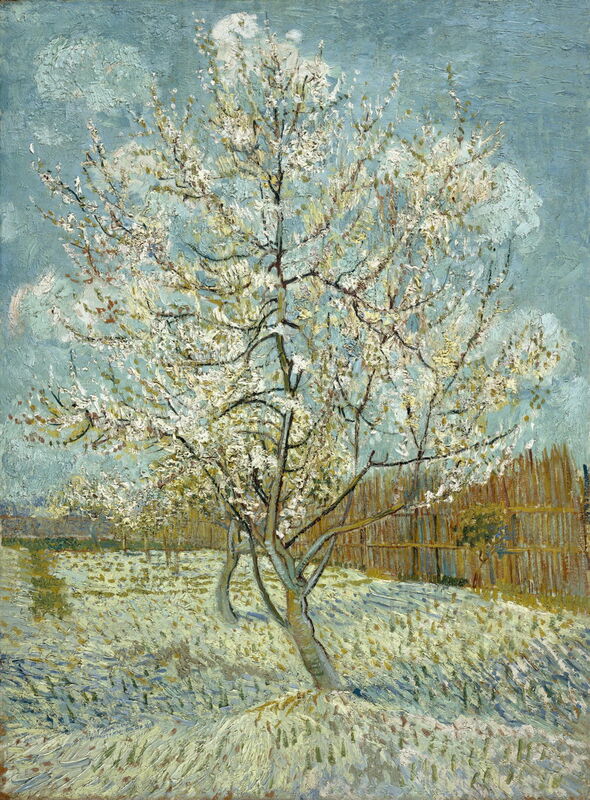 Vincent van Gogh (1853–1890), The Pink Peach Tree (1888), oil on canvas, 80.5 x 59 cm, Van Gogh Museum, Amsterdam. Wikimedia Commons. Van Gogh had been collecting Japanese prints for some years, and had copied Utagawa Hiroshige’s woodblock print The Plum Orchard in Kameido before going to Arles. His approach to painting blossoming fruit trees in Arles was, though, completely different. They are built anatomically, with trunk and branches drawn in outline, often using contrasting colour. Flowers were applied using impasto; sadly some of these have faded since, and some of the paint which now appears white or off-white was originally much pinker. Van Gogh recognised that his marks in the trees ranged from dots and blobs to larger patches, with no organisation or structure. However, the grass beneath the trees consists of more regular and orientated strokes of colour. 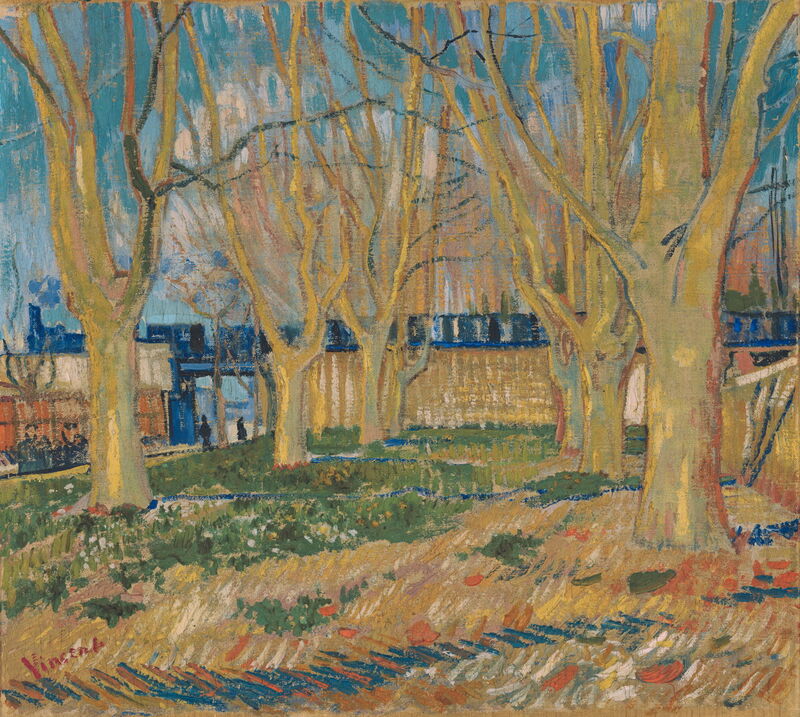 The Blue Train (1888) is another complex composition, which uses the same approach for the depiction of its leafless pollards, as those of the fruit trees. This truncated avenue is seen from a more conventional axial view, but instead of it leading a road into the distance, the ‘horizon’ is formed by a blue train on top of a viaduct. The trees form a grillage for the train. The ground is more barren here too, with a mixture of rough grass, and bare earth shown using parallel brushstrokes which in places form herringbone patterns. 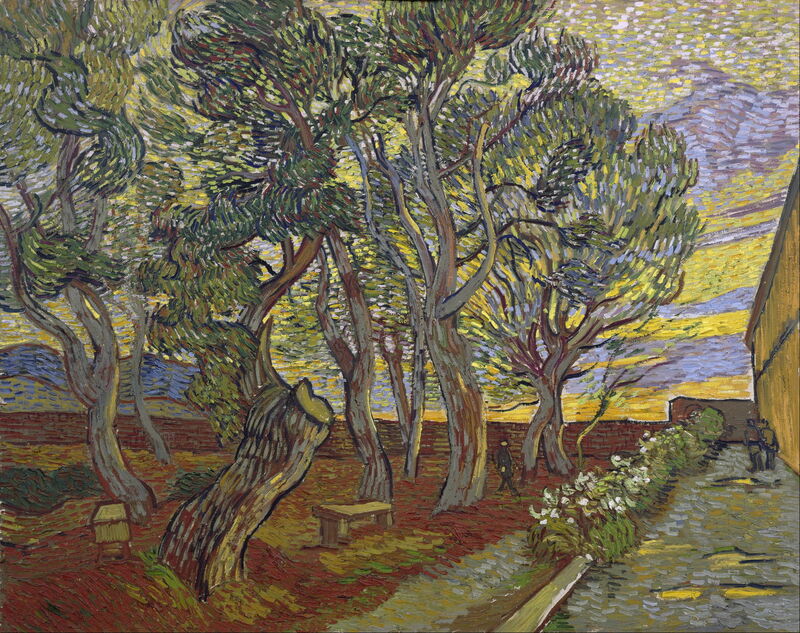 Vincent van Gogh (1853–1890), Orchard Bordered by Cypresses (1888), oil on canvas, 64.9 x 81.2 cm, Kröller-Müller Museum, Otterlo, the Netherlands. Wikimedia Commons. Orchard (in Blossom) Bordered by Cypresses (1888) is one of a pair of very similar paintings from the same period, and in very similar style. This introduces, in the background at first, another popular theme of van Gogh’s, cypress trees. Vincent van Gogh (1853–1890), Path in the Park at Arles (1888), oil on canvas, 72 x 93 cm, Private collection. Wikimedia Commons. Also painted during his time there, Path in the Park at Arles (1888) is a return to the more solid canopies and orientated brushstrokes seen in Blossoming Chestnut Tree (1887) above. Here the strokes are more orderly, and follow the anatomy of the canopy, although those in the path seem to be acquiring more of a life of their own. 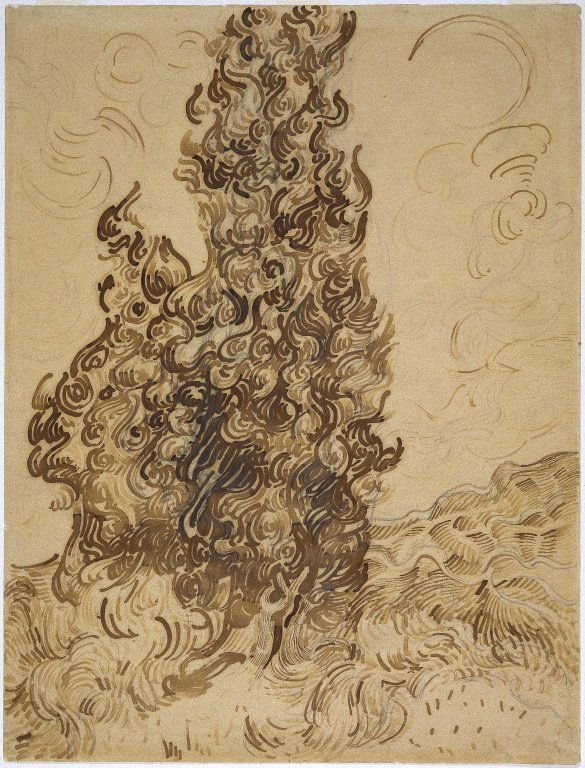 Vincent van Gogh (1853–1890), Cypresses (1889), Reed pen, graphite, quill, and brown and black ink on wove Latune et Cie Balcons paper, 61.9 × 47.3 cm, Brooklyn Museum, New York, NY. Photo courtesy of Brooklyn Museum, via Wikimedia Commons. 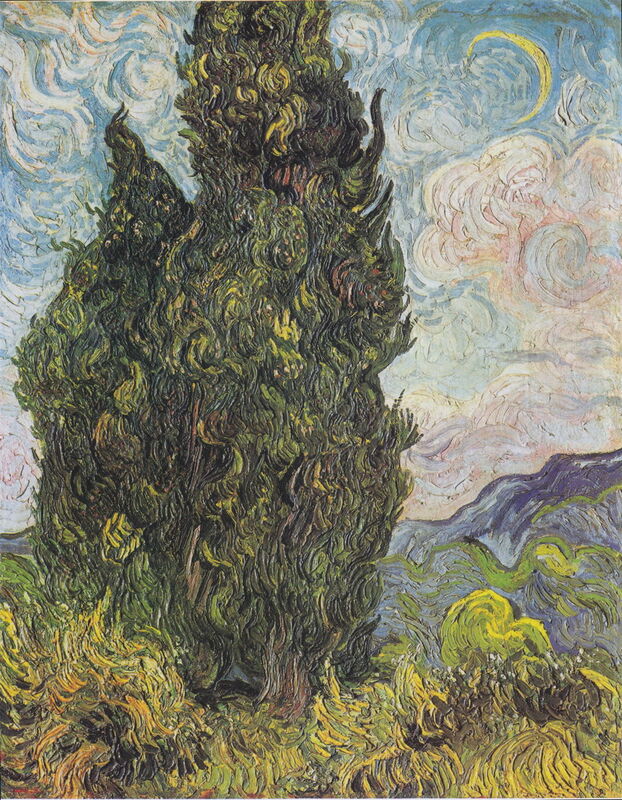 Another of van Gogh’s recurrent themes is the cypress tree, so common and distinctive in southern France. This pen-and-ink drawing gives good insight into how, in his paintings of cypresses, the brushstrokes have become organised into swirls and whorls throughout, not only the foliage of the trees, but in the ground around them, and the sky above. Vincent van Gogh (1853–1890), Cypresses (1889), oil on canvas, 93.4 x 74 cm, The Metropolitan Museum of Art, New York, NY. Wikimedia Commons. Cypresses (1889) shows that drawing realised in paint, using an impasto of rich yellows and greens. This ordered assembly of brushstrokes now extends to other species of tree too, to branches, trunks, flowerbeds, ground, and sky. Although often claimed to be abstraction, the arrangement of the strokes, and van Gogh’s use of colour, is driven by form. It is not the far more abstract use of marks in Divisionism, for example, and had already been seen in some of Pissarro’s more experimental paintings, around his time as a Neo-Impressionist. Vincent van Gogh (1853–1890), View of Arles, Flowering Orchards (1889), oil on canvas, 72 × 92 cm, Neue Pinakothek, Munich. Wikimedia Commons. 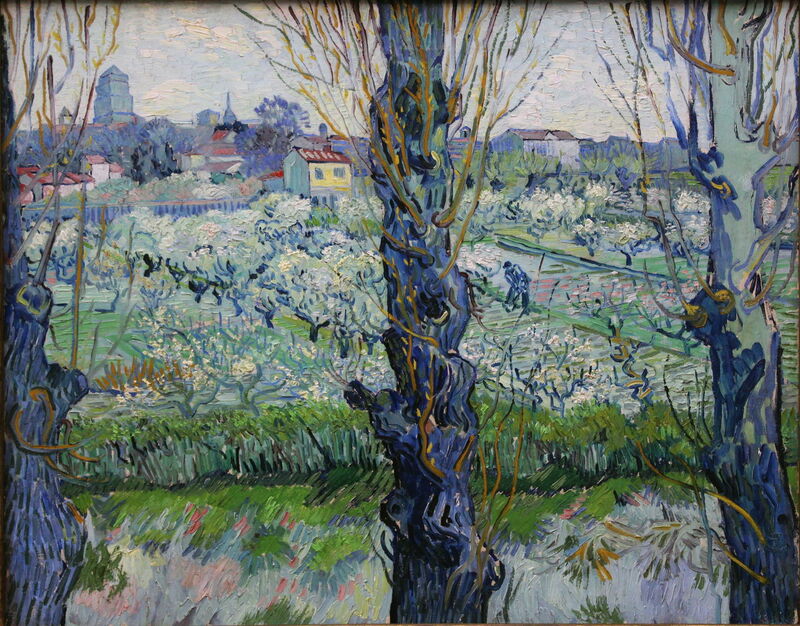 View of Arles, Flowering Orchards (1889) is another complex composition, with the grillage of trunks in the foreground, fruit trees in flower in the middle distance, and the town of Arles behind, integrating his previous explorations of each element. 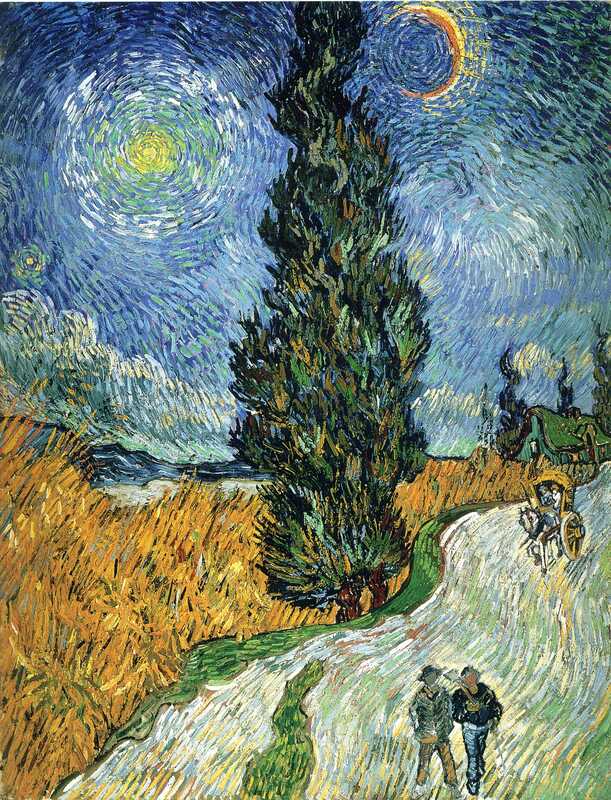 In this painting, van Gogh uses his formed brushstrokes most in the foreground, and they fade further into the distance. Vincent van Gogh (1853–1890), Olive Grove (1889), oil on canvas, 73.03 × 92.08 cm, Nelson-Atkins Museum of Art, Kansas City, MO. Wikimedia Commons. 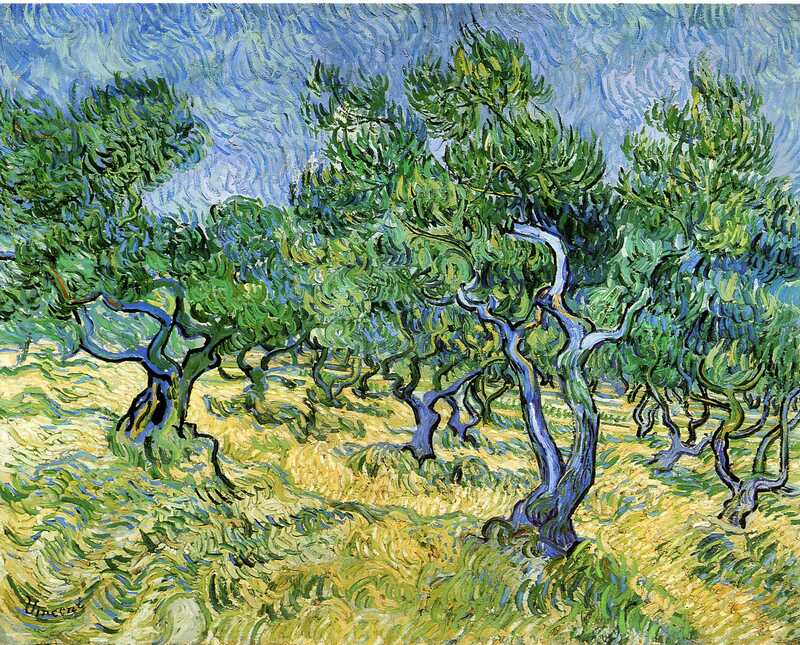 Olive trees were another recurrent theme during 1889. Their style is consistent with that of The Garden of Saint Paul’s Hospital (1889) above, with similar swirls and whorls to those seen in his cypresses. 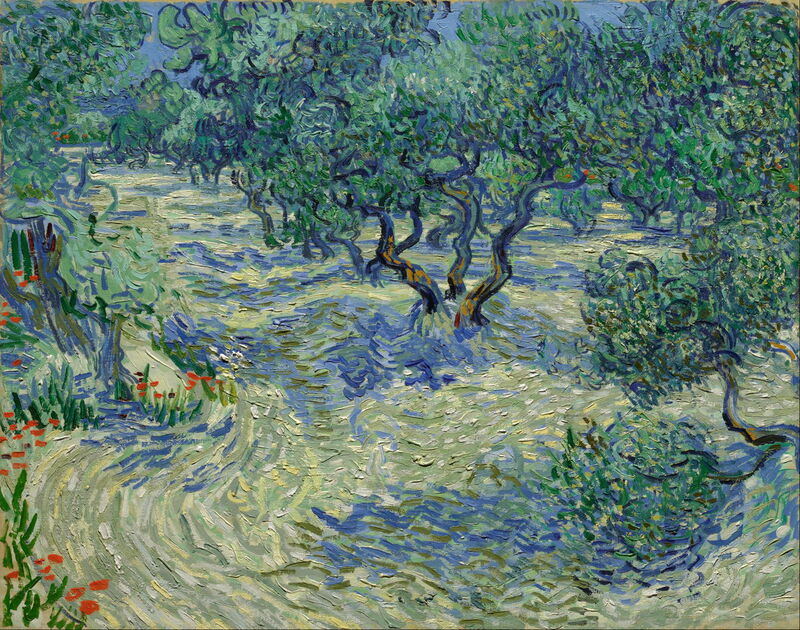 Vincent van Gogh (1853–1890), Olive Grove (1889), oil on canvas, 72 x 92 cm, Kröller-Müller Museum, Otterlo. WikiArt. As with his late paintings of cypresses, patterned brushstrokes extend throughout the sky. This is quite different to the more conventional sky seen in View of Arles, Flowering Orchards (1889). Vincent van Gogh (1853–1890), Tree Roots and Trunks (1890), oil on canvas, 50 x 100 cm, Van Gogh Museum, Amsterdam. Wikimedia Commons. In the final few months of his life, Vincent van Gogh revisited some of the themes and motifs in his earlier work. This large and bright study of Tree Roots and Trunks (1890) refers back to some of his earliest drawings, such as Tree roots in a Sandy Ground (1882) above, with its wild and twisted forms. However, his style uses rich and bright colours, with bursts of orientated brushstrokes, in marked contrast with his early work. Vincent van Gogh (1853–1890), Undergrowth with Two Figures (1890), oil on canvas, 49.5 x 99.7 cm, Cincinnati Art Museum, Cincinnati, OH. Wikimedia Commons. 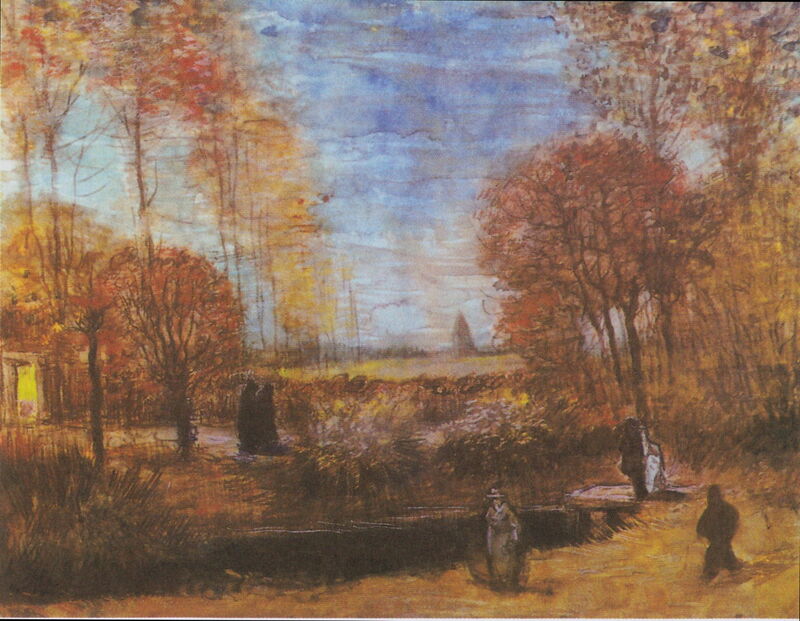 The grillage of rows of planted trees is another visual reminiscence expressed in thick, richly coloured paint using his late techniques. Road with Cypress and Star (1890), painted just two months before his death, is perhaps his ultimate expression of the form, texture, and colours of cypress trees in Provence, its swirling brushstrokes rising to form halos around the crescent moon and solitary star. Vincent van Gogh painted many trees, and developed a characteristic style for depicting trees in the final frenetically-productive years of his brief career. Starting with an approach rooted in the styles of Corot and Pissarro, by 1887 he had taken to constructing foliage using carefully orientated and relatively coarse brushstrokes. Although he painted the flowers on fruit trees quite differently, using impasto, by 1889 his trees were completely composed of arrays of strokes, which followed their form and texture. In some of his late works, those marks take over everything within the painting, sky included, in a unique manner. His late paintings of cypress and olive trees, in particular, stand as some of the most remarkable depictions of trees by any painter. Metzger R and Walther IF (1996, 2008) Vincent van Gogh 1853-1890, Taschen. ISBN 978 3 8228 3768 9. Re-presented as a two-volume paperback Van Gogh the Complete Paintings (2010), Taschen. ISBN 978 3 8365 2299 1. Vellekoop M ed (2013) Van Gogh at Work, Yale UP. ISBN 978 0 300 19186 8. Vellekoop M et al. eds (2013) Van Gogh’s Studio Practice, Yale UP. ISBN 978 0 300 19187 5. Posted in General, Painting and tagged Corot, cypress, grillage, landscape, olive, painting, Pissarro, plein air, trees, van Gogh. Bookmark the permalink. This article is very excellent. I’ve looked at other posts on your website and am impressed. Great job. Thank you. I hope that you continue to enjoy.